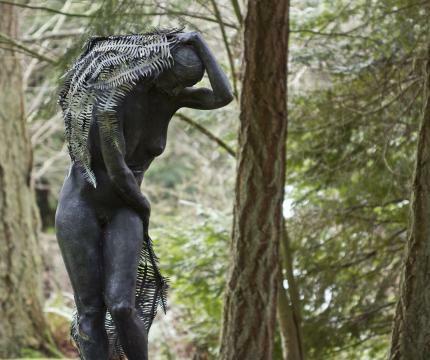 Noted artist Ann Morris, her son Brook Morris of California and daughter Clea Costa Van Voorhis of Illinois are providing Western Washington University and its students with an extraordinary gift – 14.5 acres of Lummi Island forest that surround her studio and provide the setting for her figurative bronze sculptures sited in the wild quiet called Sculpture Woods. Under the generous philanthropic agreement, Ann Morris and her family are donating Sculpture Woods to the WWU Foundation. In turn, the university is committed to maintaining the sculptures and using the property to enrich its curriculum. Sculpture Woods will be transformative for the ways in which students and faculty engage their own work, most notably with the gift of time and place in which to nurture their own creativity, thereby honoring Ann’s spirit and vision,” said Kit Spicer, dean of Western’s College of Fine and Performing Arts. 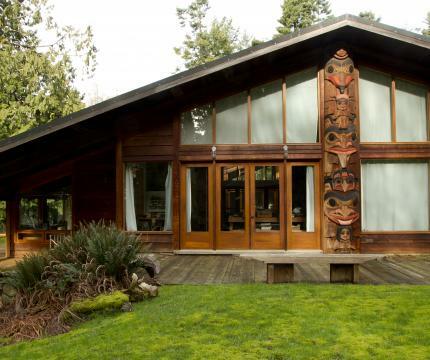 Sculpture Woods is a beautiful and tranquil oasis of wooded property overlooking Rosario Strait on Lummi Island. Morris has worked at this property for 23 years, and has built a magnificent art studio, gallery and yoga house on the property. As part of Morris’ work, she has created 16 life-size bronze sculptures, permanently installed outdoors. “Sculpture Woods has been in the making since 1995. The studio in its quiet natural setting has been the home of my creative work. What has emerged is a Place, where my art lives and more can be generated. The gift of Sculpture Woods to Western Washington University Foundation is given in the hope of this Place continuing to inspire creativity in all who come here, Western students, professors, the public. May it be a gift that continues giving,” Morris said. Morris now will lease back the property from the WWU Foundation, continuing to utilize the property and facilities for as much time as she desires. At her discretion, WWU may host certain events at the property. When Morris decides to terminate her lease, the rights of usage on the property will transfer to the Foundation, which will maintain Sculpture Woods in its natural state for the benefit of the university and the surrounding community. Joining Morris is a small group of generous private donors who have committed nearly $1 million to preserving the collection and its home, and promoting arts education for generations of Western students and visitors. This separate endowment will provide funds for preservation of the property. To contribute to the endowment, please contact Sonja Sather at: Sonja.Sather@wwu.edu or (360) 650-3384; or visit foundation.wwu.edu/SculptureWoodsEndowment. Sculpture Woods is open to the public, 10 a.m. to 5 p.m. on the first Saturday of every month.